We all make mistakes, right? It’s how we right the wrongs that count, nowhere is that truer than in manufacturing. Defective products can take a chunk out of profitability; but even more important, they can do serious damage to your reputation. When customers must reject shipments, face delays to allow for rework, or encounter their own production problems because of your quality issues, they lose confidence in your supply performance. That’s why avoiding defects should be a priority in your operation. When production errors do happen, it’s critical that you quickly identify the cause(s) and take immediate corrective action. Correcting defects is not an inexpensive undertaking: there are costs associated with discovery, problem-solving, rescheduling replacement materials, equipment resets, rework, paperwork, and expedited transport and delivery. A product is considered defective when it deviates from prescribed quality standards or specifications. The causes can range from use of substandard materials and components to incorrect assembly to faulty equipment to operator error. Regardless of cause, scrapping defects is a huge waste of time, effort, energy, equipment and materials, not to mention replacement costs. Design products to prevent incorrect assembly of components. Standardize procedures and controls so that different operators on different shifts produce consistent quality. Inspect incoming materials and components before introducing them into production. Minimize transportation and handling to avoid damage. Maintain equipment and environments to stabilize production conditions. Train operators to spot defects and authorize them to stop the line for correction. Make no mistake, errors and slip-ups will always happen but you can reduce their probability and impact. Ask yourself, what could go wrong? 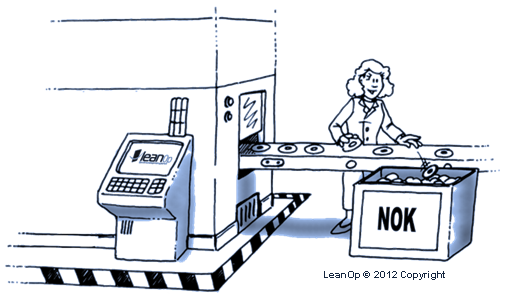 Let UNEX help you mistake-proof your assembly processes by implementing lean manufacturing principles on your shop floor. Contact your Pickologist to learn how UNEX can turn your assembly process into a well-oiled machine.